On 13 April 2017, United Nations Secretary-General António Guterres announced the appointment of Vera Songwe of Cameroon as the next Executive Secretary of the United Nations Economic Commission for Africa (ECA). She succeeds Carlos Lopes of Guinea-Bissau, to whom the Secretary-General is grateful for his commitment and dedicated service to the Organization. Ms. Songwe brings to the position a long-standing track record of policy advice and results-oriented implementation in the region, coupled with a demonstrated strong and clear strategic vision for the continent. Prior to her appointment, she was the International Finance Corporation’s Regional Director covering West and Central Africa since 2015, and non-resident Senior Fellow at the Brookings Institute: Global Development and the Africa Growth Initiative since 2011, she was previously the World Bank’s Country Director for Senegal, Cape Verde, Gambia, Guinea-Bissau and Mauritania between 2012 and 2015. Before that, Ms. Songwe held the post of Adviser to the Managing Director of the World Bank for the Africa, Europe and Central Asia and South Asia Regions from 2008 to 2011, and Lead Country Sector Coordinator and Senior Economist for the Philippines from 2005 until 2008. She joined the World Bank as a Young Professional. 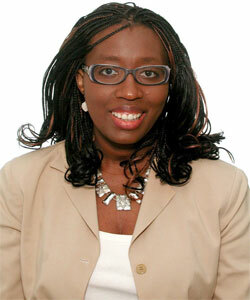 Born in 1968, Ms. Songwe earned a PhD in Mathematical Economics at the Centre for Operations Research and Econometrics, a Master of Arts in Law and Economics and a Diplôme d’Etudes Approfondies in Economic Sciences and Politics from the Université Catholique de Louvain, in Belgium, as well as a Bachelors of Arts in Economics and Political Science from the University of Michigan in the United States. She is also a graduate of Our Lady of Lourdes College in Cameroon.